This postcard comes from the collection of Thomas JACKSON of Bangor, Co. Down. Identification of the people in the photo is a work in progress - HELP! The three men in the back are (I suspect) Unknown (could he be Thomas Jackson REED - son of Margaret JACKSON & Robert Hamilton REED? ), Alan SKUCE (husband of Maud Elizabeth REED), and James USSHER (husband of Eva Oliver REED). The women seathed are Eva Oliver USSHER (nee REED - daughter of Margaret JACKSON & Robert Hamilton REED), Elizabeth "Bessie" GILMORE nee BROWN (daughter of Elizabeth JACKSON & Thompson BROWN), I am unsure who the next two are - although I suspect they are daughters of Margaret JACKSON and one of them would be Maud Elizabeth REED, then the matriarch - Margaret McCULLAGH nee JACKSON (her first husband was REED) and on the extreme right is another daughter (I believe) and one I should recognize by now. 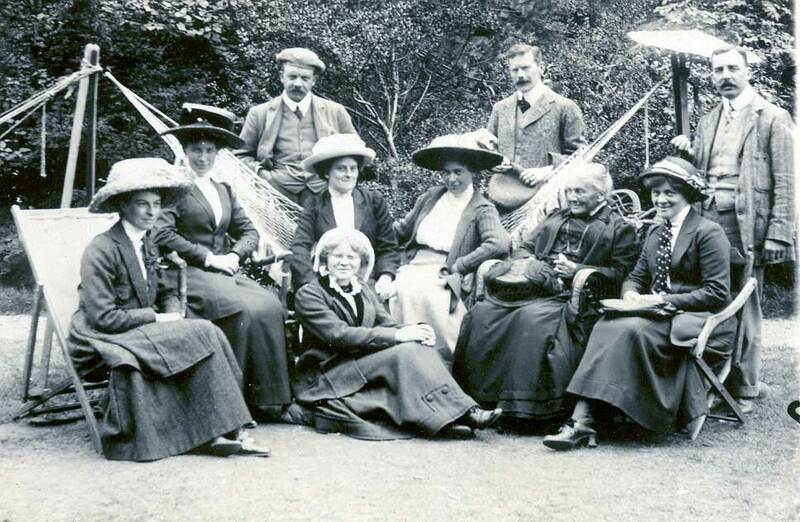 Seated beneath, I believe is Elizabeth McCULLAGH (daughter of Margaret JACKSON). Sharon Oddie Brown, September 4, 2006. Mother  got your letter today she has no time to write but we are sending you a family group instead. You need not send this on to Brownie  as Mother sent her one. We all leave on Saturday for Enniskillen  . We got home from Isle of Man  on Tuesday. Very severe crossing. The wee nieces are in great form. Erna  has won all hearts. They had tea with old Mrs. Bradshaw  this evening. Mother, Eva  , Sally  and Florence  spent yesterday evening in Drumfaldera  . Glad to hear of all the good things Sophie  sent you. If possible Mother will write tomorrow. Love from all. Yours Mattie  . 31.8.1911. Theo Roth, Gardens studio, Glen Helen & Peel. I.O.M. “Brownie” Alice Margaret McCULLAGH (1894-1945), daughter of Andrew Bradford McCULLAGH & Margaret JACKSON (1853-1944) – sister of Sir Thomas JACKSON. I do not know who might have been at Enniskillen. There may have been a family “connexion” on I.O.M since there is a photo of the JACKSONs on the steps of a Bank – possibly there – prior to 1903. In 1911, I am unsure who was still at Drumfaldera. Sophie, a friend of Alice AKA “Brownie” from school in Switzerland. Maud Elizabeth SKUCE née REED (1878-1958), daughter of Robert Hamilton REED & Margaret JACKSON – sister of Sir Thomas JACKSON.